Final Fantasy XV will receive free downloadable content collaborated with Terra Wars, Shadow of the Tomb Raider and Sengoku Action Puzzle DJ Nobunaga, Square Enix has revealed. Launching September 25, the series of DLCs offers players a new dungeon to explore featuring Terra War’s Sara and new costumes for their avatars. 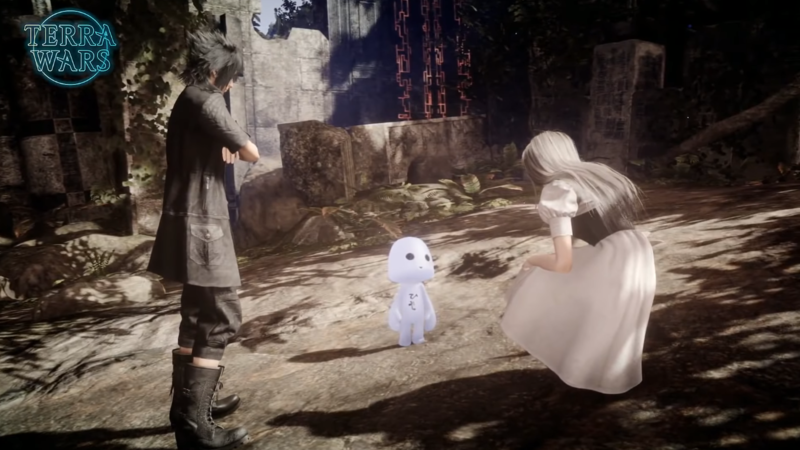 Correction: Earlier, we incorrectly reported that a new mini-game would be included to Final Fantasy XV. We have updated the post to amend the mistake. Final Fantasy XV is now available for PlayStation 4, Xbox One and PC. Posted in Final Fantasy XV, Tokyo Game Show 2018. So whats going to happen to all the collaboration events once there’s a complete complete edition of this game? They’re all temporary, they won’t stay permanently. am i dreaming new ff xv dlc! Maybe one of these days, someone will figure out how to mod them back in on the PC version, but as it stands, they’re either show up or get left. Them’s the breaks with a live game. But all said and done, FF15 actually always had good events. …Well, okay, the Carnival was lame, but Assassin’s Creed was a legitimately fun event. I don’t know why, but I sort of get the feeling that after they cut support for FF15 completely, they’ll patch the carnival in as a permanent fixture. But yeah, Assassin’s Creed is over and not coming back, and likely the same with Terra Wars once it ends. Didn’t they also say that they would include the Platinum Demo in-game someday? Anyways, I agree. This looks much more interesting than the last two events! They said it but i dont really think they are going to do it. Didn’t the survey confirm that collabs was what people most disliked about the DLCs? Wohoo…….The nice thing I can say is, Sara seems cool. Would be neat if they added Sara to the gameworld as a possible new recruit. I really hope that they will show some progress on the new dlc’s and especially show more of the map editor. If not I’m gonna be pretty disappointed. Probably because all the other DLC episodes had to be paid for. This one is free. Not gonna lie, that Terra Wars event has me intrigued, even if I have had no desire to touch that series tbh. Not so much into the Tomb Raider stuff though, but I’ll definitely be going back to the game just for the Terra Wars stuff. I’m honestly at the point where anything new to XV just makes me sigh. I waited a long time for Versus XIII, got XV instead. Seeing real world brands like Coleman in XV sorta took me out of the their world but after Assassin’s Creed started throwing their brand in there it started feeling more like a cash grab than anything. I know the DLC is free and I never complain about free DLC but I’m just getting tired of FFXV, I’d love to see a new Final Fantasy already. We technically haven’t had a fresh mainline Final Fantasy for a decade now. FFXV articles STILL get the most attention for a reason. You critics want new FFXV just as much as we do! Bear with the new four dlc. At the end of 2019 FF XV (which really was dead from the start) will die for eternity. Just look at the patch updates. The last one was a Bugfix in June or something. It’s dying for good. So far there were two timed events: Carnival and AC Festival, both were free, same as this time around, price was not a factor why people disliked them, they’re disliked because A: they’re timed exclusive, and B: use development resources that could be spent on something else that people actually want. everything’s pretty much fixed, what else do you expect them to patch? Beat this game months ago, after taking a year and a half off at chapter 6… waiting for them to finish the freaking game. Apparently they’re still not done? Just stop already, seriously. The game’s done. This “update” took like ten minutes to “beat”… the final “boss” was a joke. It was kinda interesting, the little aliens reminded me of moogles, saying nothing but “Hiso Hiso”… but ya.. back to the game I was playing now. I just wish they’d do like everyone else and put the temporary stuff like the assassin festival back in permanently, rotate it with the Carnival. I thought they would, or I would’ve temporarily stopped playing whatever I was when the AC festival released to do that. in my case, I disliked the AC event, but not the Chocobo Carnival one. The Carnival at least felt like some special stage or like the Gold Saucer, in a way. It was an original FF-idea. The AC event was cool, but it didn’t fit into FF. People already made fun of XV with names like “DmC FF” or “Final Creed”. I like representations of other games in fighting games like Soul Calibur or Super Smash, or in RPGs intended to have them, like Kingdom Hearts, but I don’t wanna see them in mainline-FFs. It destroys the athmosphere and the feeling. It makes unnecessary connections to the real world which I’m trying to escape when playing JRPGs. I’m fine with FF Spin-Offs, they can use the “freedom of creativity” there, or with collabs in XIV like Monster Hunter or Yokai Watch, since in my eyes XIV is not a mainline-title.